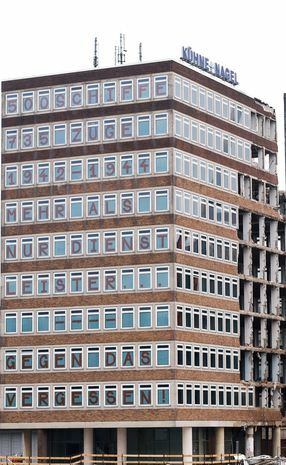 Activists marked a building of German logistics company Kühne & Nagel in Bremen, Germany on Friday. Kühne & Nagel is the world’s third biggest logistics company and was one of the profiteers of the holocaust in the 1940’s. The Kühne & Nagel branch in Bremen is being demolished at the moment, as the company will get a new building in the same city. The Kühne & Nagel building that is being demolished and that was marked on Friday, played a key role in the so-called “action M” of the German nazi regime in the 1940’s. Activists marked the building with the following text: “500 ships, 735 trains, 1942-1944, More than just a service provider, Against losing sight!”. “Action M” (M stands for Möbel which is the German word for furniture) of the German nazi regime started in 1942 and its goal was to confiscate furniture and fixtures from what the German nazi regime considered “abandoned Jewish homes”. The homes of many German Jews were empty because of mass deportations by the nazi regime to the concentration camps. The confiscated items were used for offices of German authorities in the occupied eastern part of the German Nazi reich. Kühne & Nagel earned profited off the transportation of the confiscated furniture from 72,000 Jewish homes in France, The Netherlands, Belgium and Luxembourg. The Kühne brothers were also regular guests of German politicians after the second world war, although they refused to provide information about the role of the company in “Aktion M” until July 2015. The information that was provided was sparce, and wasn’t given until after journalists and historians put immense pressure on the company. Questions by journalists about their role in the second world war were refused by Kühne & Nagel, but that didn’t stop social-democrat (SPD) and mayor of Hamburg Olaf Scholz, from honouring the company during a speech at their 125th anniversary in July 2015. Scholz said a few words about Kühne & Nagel during the Nazi regime, but by giving a speech and attending at the anniversary of the company he showed support for these profiteers of the holocaust. The company is now led by Klaus-Michael Kühne, son of Alfred Kühne. In 2008 he expressed his racist views openly by saying that he wants to keep the company as “full-blooded German” as possible during the time he allegedly “saved” the Hapag-Lloyd logistics company from Chinese investors. In 2016, he said Europe should slow immigration during an interview with German media.